• الموضوع : Cleric El Husseini: from The French Ministry of Interior extends condolences to France and strongly denounces and condemns terrorist attacks in Paris and asked the Muslims European citizens to maintain citizenship values: Countries of nationality are your . Countries of nationality are your final country and maintaining its security and protecting it is legitimate duty. During his visit to Ministry of Interior in France and his meeting with French Deputy Minister of Interior for Religious Affairs (lourent burin) and Adviser of the Political Relations (Gautier Lekens) and in charge officer of Islamic Relations (katia Mebtooche) and in charge officer of Ministry of Foreign Affairs relations (Jean Perrier) Cleric Mohamed Ali El Husseini, Secretary-General of the Arab Islamic Council in Lebanon issued a statement which denounced and condemned the terrorist operation that took place in Paris at night and extended Consolation for the victims. Cleric El Husseini asked the Muslims living in Europe to maintain the civilized citizenship values that are implemented in these countries such as France, stressing on fact that their adherence to the Islamic religion does not contradict with their National loyalty to the country they are currently living and carrying its nationality. 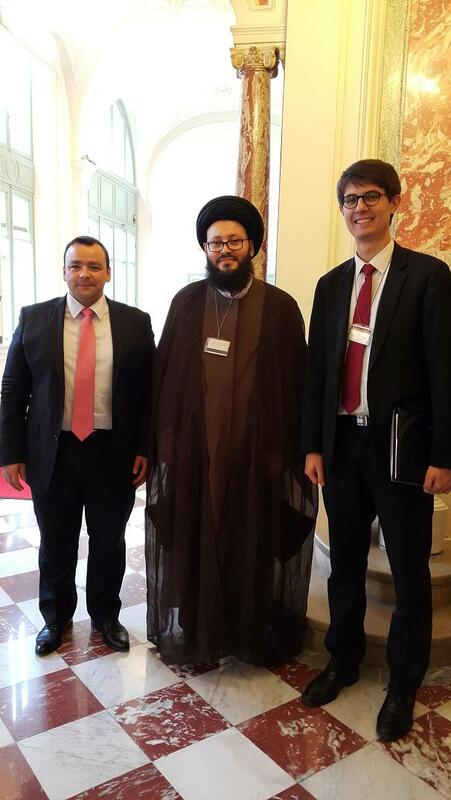 El Husseini requested French officials to collaborate with loyal clerics to: fight terrorism at the intellectual level, promote and strengthen the moderate Islamic speech; knowing that the elimination of terrorism, does not take security measures only, but also through an integrated process involving all areas. Mr. El-Husseini addressing the Arab origin French citizens and others in the European countries they are living in and have earned the honor of carrying its identity; confirmed the need to deal with the countries as a final home, maintain security and stability, and work to shield it while facing any external or internal dangers. These countries molded the cuddling protector to them when they sought refuge, accordingly it is their legitimate duty to respond to this favor in being faithful citizens. Cleric El Husseini clarified that The Nation of one billion Muslim is not terrorist, and that Islamophobia should not fester and control the mentality of Western officials. Islam by origin is a civilized religion that urges for openness, dialogue and tolerance; and from this respect direct relations and dialogue with their real representatives should be established, leading for the welfare of European Muslims and the countries that belong to. Mr. El Husseini called upon the European governments to be tolerant and flexible with their Muslim citizens while they practice their duties and religious rituals that does not contradict with the countries’ laws in force; knowing that hindering them without legal justification, pushes some of them to extremism and adoption of deviant methods in their worship exercise, which in turn make them vulnerable to exploitation by aims owners. Cleric El Husseini finalized by calling upon European governments and Muslims citizens in Europe to maintain co-existence, stressing on the Muslim citizens to preserve the best aspects of cooperation with political authorities and security services in order to protect the communities which they currently belong and live in; this is religious duty that makes it imperative for every Muslim to maintain his/her homeland.